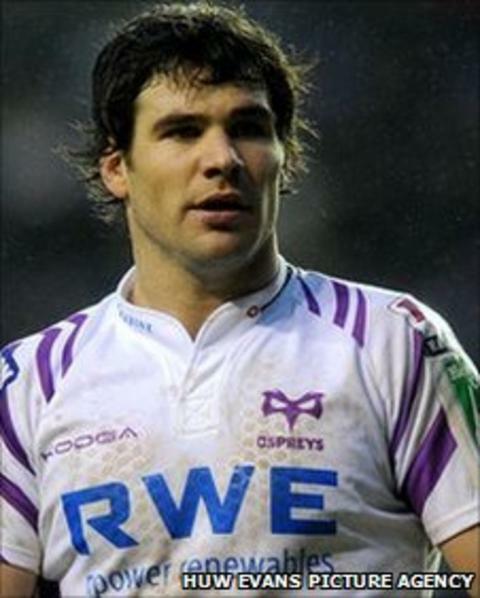 Ospreys will let Wales scrum-half Mike Phillips leave the region, director of rugby Scott Johnson has confirmed. Phillips, 28, who is contracted to the Ospreys until 2014, has been linked with a move to France. Ospreys team-mates James Hook and Lee Byrne are already heading to France next season. "After continued requests from Mike over the last 18 months, we've agreed to let Mike go as soon as he can find another club," said Johnson. "I think it gets to a stage where within an organisation, anyone who doesn't want to be here will move on. "It's the modern player. Sadly that's the way the sport's going and I'd rather have people here who want to be here. "What tends to happen is after a while, you're spending so much of your time and energy on so few players and we've got a good young [number] nine [Rhys Webb] coming through who needs our attention as well, so it's pretty simple." Johnson says Phillips may have not played his last game for the region though as he will still be picked "on merit". Since returning from Six Nations duty, British and Irish Lion Phillips has been behind Rhys Webb in the Ospreys' pecking order. And the region have also signed Samoa scrum-half Kahn Fotuali'i from New Zealand Super 15 side Crusaders. But Phillips' departure will be the latest big-name exit from the Liberty Stadium. Gavin Henson left earlier this season for Toulon while fly-half Hook (Perpignan), full-back Byrne (Clermont Auvergne) and prop Craig Mitchell (Exeter) have announced they are moving on at the end of the season. Experienced Kiwi back-rowers Jerry Collins and Marty Holah could also leave in the summer. But the Ospreys have signed back-rowers Joe Bearman from the Dragons and Samoan George Stowers from London Irish while captain Alun Wyn Jones and Shane Williams have signed new deals. Phillips won his 51st international cap in Wales' Six Nations defeat in France and is contracted to the Ospreys until 2014 after signing a new big-money deal in March 2010. Phillips joined the Ospreys from Cardiff Blues in April 2007 for a deal thought to be worth £700,000. "We've kept the people we really wanted to keep and fought hard for and there will be more announcements shortly," added Johnson. "These are changing times and we've got to confront them. "We've got to get back to what we've been known as and we've done a lot of great things. "We want to represent our region in the way we're comfortable as and there's no coincidence we produce so many international young kids and we want to continue that. "It's a balancing act and if that means us reinventing ourselves, we'll do so."